Abby: Mom, I don’t want it to be my birthday. Abby: Because then it will be over and I’ll have to wait a whole ‘nother year for it to come again. We have this same conversation every year — which is amazing to me, because between the classroom doughnuts, the annual restaurant-picking ritual, the party with friends, and the cousins-and-grandparents get-together, we seem to be celebrating Abby’s birthday all year long. All year long, it’s on her mind. “Where should my party be this year?” she’ll ask on New Year’s. “What restaurant are we going to on the night of my birthday?” she’ll ask in the middle of her sister’s February birthday dinner. “What should the theme of my party be?” She asked when I picked her up from camp one day in July. I don’t want to pretend that this is hard work. All of us got into picking the theme this time, submitting our best proposals to the Birthday Boss. How about an “almost-sleepover” party? Not all my friends play soccer. A secret agent party, like Phoebe’s 9th? We wracked our brains. What did Abby love more than anything else in the world. More than her LaLaLoopsy dolls, more than Lemony Snicket, more than flying down a soccer sideline? Once Andy threw out Japan as a theme we wondered what took us so long to get there. Abby’s idea of happiness has always been miso soup, shrimp shumai, and chicken teriyaki, followed by a private screening of Totoro. Candy Sushi! For twelve girls I made two sheets of Rice Krispie Treats, cutting them into round and square sushi-size pieces. Then I proceeded to load two trays (one for each side of the table) with some world-class junk: Swedish fish, gummy worms, jelly beans, Airhead Extremes (the rainbows), Dots, chewy Now-and-Laters, green Fruit-by-the-Foot (which stood in for the seaweed and is truly, hideously repulsive), and sour peach strips that were a dead ringer for ginger. (I think as I type this a week and a half later, the girls are just now coming off their sugar rush.) To make things a little easier for everyone — I chopped up a bunch of the candy into bite size pieces so they’d fit nicely on or around the rice patties. I made a sample plate for the table (which, with a few skinny candles tucked in, also doubled as the birthday cake) to give the girls some ideas for assembling their own. 1) Two kids stand a foot or two across from each other (within reachable distance) and at the same time shout “NinJA!” When they say the “JA” part, each strikes a dramatic Ninja pose. 2) Taking turns, each kid has one ninja strike to reach across and tag the other’s arm. If your arm is tagged, it goes behind your back. You lose when both arms have been tagged. There are ways to play this in a circle, which is how the girls learned it at camp, but we had the guests find partners and face off each other, mixing up the pairings every few minutes. If none of this makes any sense to you, watch this video, or ask your kids — who no doubt already know how to play — to explain it to you. Pass the Parcel This game is a staple of all our birthday parties. 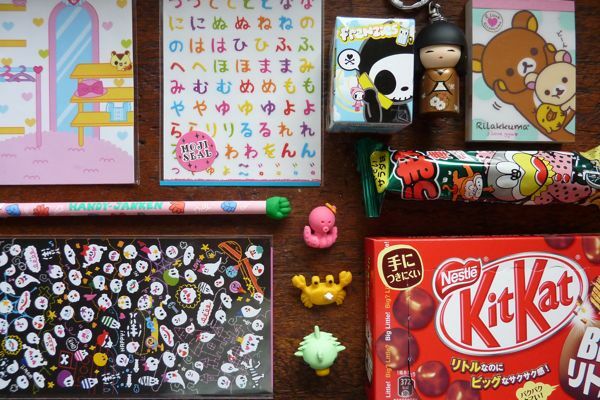 For those of you unfamiliar with how to play, you buy as many gifts as you have guests — little gifts, like packs of gum or stickers, or in this case, Japanese erasers from Amazon and little trinkets from Kinokuniya in NYC — plus one larger one that will be the winning gift. You wrap that gift first, then you wrap each subsequent gift in its own layer, creating a parcel with as many layers of giftwrap as there are gifts. The kids sit in a circle and pass the parcel around to music. When the music stops, whoever is holding the parcel gets to unwrap one layer and keep the gift that falls out. Obviously, you want to time it so that everyone gets to unwrap a layer. But once everyone has a little gift and only the big one remains, you can stop the music randomly. This makes it a little more exciting for everyone. Japanese sodas, procured from a local Asian grocer. Strawberry for the guests, pineapple for the birthday girl. 6:30 Welcome! Hang out, jump around, chit-chat, etc. Goal here is to ride the party anticipation and kill 15 minutes without doing any work. 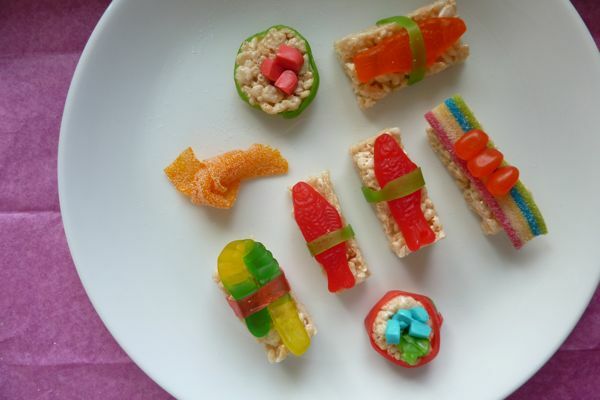 7:30 Make-Your-Own Candy Sushi. We figured as long as they were already at the table, we’d keep ’em there. 8:00 Celebrity – Japanese Edition. Three teams, forty names in the pot — we mixed in some famous Japanese characters like Astrokid, Pikachu, Hello Kitty, Totoro, and Sushi Mike, the proprietor of our local Japanese restaurant with the obligatory Taylor Swifts and Lady Gagas. We play the three-round version of Celebrity: Round 1 – You can use as many words as you like to describe the mystery name to your team. Round 2 – You only have three words. And Round 3, no words, all charades. Girls loved it. And again, no gear, just paper and pens. 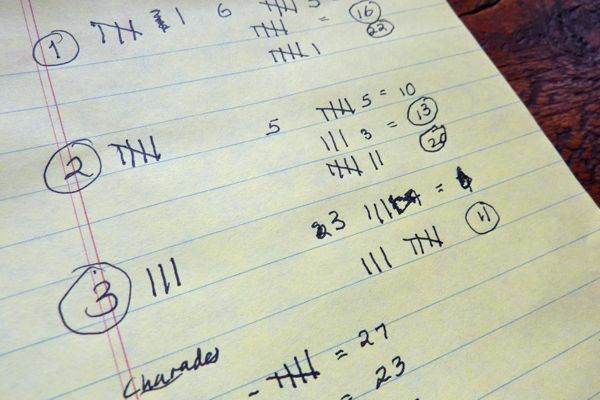 Abby’s Grandfather kept track of how many points each team got in Celebrity, a resonsibility he took very seriously. The girls helped assemble the goody bags: cellophane bags filled with a chocolate lollipop from our local Asian grocer plus a few Ninja dolls from Oriental Trading. We turned office labels into Japan flags with a black Sharpie and a red magic marker. PS: In case you are wondering where the kids are — all the party photos were taken a few hours before they arrived. The Zen vibe you are admiring from afar? Gone…as soon as the first little Ninja warrior walked in the front door. Jenny – when did you start the birthday traditions with your girls? My little one will be 3 next year, but I’m wondering if that is a bit young and I should really wait another year or two. Thanks! You are very inspiring for how to have fun without being over-the-top. Love your blog, love this idea! Jenny – this is brilliant! Great job. 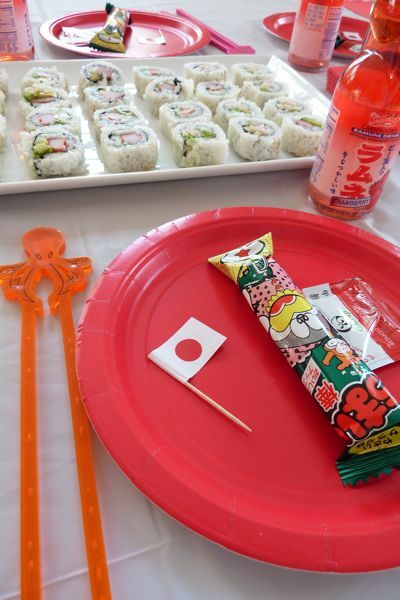 I can’t tell you how much I love the fact that your daughter chose Japan for her party theme. Brilliant! Wow!!! Quit your day job already and be a party planner from now on. This is incredible. I love how unique your themes are, I need to up my game (or just score an invite to one of your parties!) Wonderful job all around! Damn! What an amazing party. You rocked it, mom! This looks like such a fantastic party. 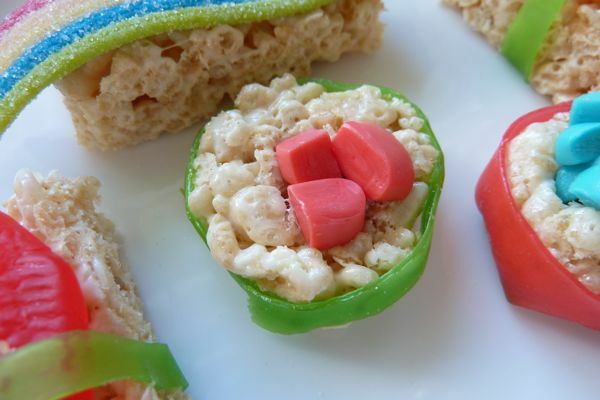 I especially love the candy sushi idea, and I’m sure the kids had so much fun with it. I love your party posts. Lots of creative ideas (candy sushi! ), but totally realistic (dinner will only take up 15 minutes!). Thanks for sharing. Meg – I think it’s up to you when to start birthday traditions. Obviously the parties can start with year 1, but knowing what I know now (and how many many millions more parties there would be to plan) I probably would have kept the early ones as simple as possible.. The girls at 2 certainly wouldn’t be able to appreciate the difference between, say, a homemade red velvet birthday cake, and one picked up at Grand Central on the way home from work in a scramble the night before the party. (Which is often how it did happen back then when I was working and commuting five days a week.) As for the restaurant ritual, we started that when they were 5 or 6 I think. That’s really fun and definitely my favorite night of the yearlong birthday extravaganza. Thanks to everyone else for your nice notes! JENNY!!!!! I HAVE TO WRITE IN ALL CAPS!!! COOLEST THING EVER!!!! My daughter and I just lost our minds over this. We are Japan -o-philes of the highest order. We LOVE TOTORO! We love Japanese food. Hello Kitty. Miso. Sushi. Japanese Erasers. You name it, my daughter loves it! I’m pinning this whole party, linking you to my Cool Stuff List this Friday and we are probably going to throw this very same b-day next year! THANK YOU FOR THIS MEGA DOSE OF AWESOME! Jenny, this is the best &#$)!! * party I have EVER seen! Will bookmark this for a later date! Paulina loves, absolutely adores, can’t-get-enough-of, sushi. This will definitely be a winner. My six year old son is crazy for sushi. And totoro. We are soooo copying this for his seventh! This is ridiculously clever and useful. Thanks! Jenny, this party looks amazing! You and Andy truly are birthday party rock stars – perhaps your next book should be all about parties (for kids and adults). In this age where out-sourcing parties is so so common, your daughters are lucky to have creative, enthusiastic parents to make such a fabulous homemade celebration. You had me at rice krispy treat and gummy sushi! Maybe I can incorporate some of your ninja ideas for a Ponyo party for a 3-year-old…or I could just wait until my daughter is old enough to eat gummies without me hovering over her ready to do the heimlich! Candy sushi? You have quite a precocious little one. Brilliant. Your post perfectly fit into my days preoccupations. My son was born in Tokyo, five years ago and I am planning a birthday treat for him. He hates being celebrated so we are simply having some friends over to eat cake with his, but will think of some activities to keep everyone happy. and now all you have got me thinking of is seasonal kit kats. I had forgotten about those (or done my best to suppress the memories) I have to have one! you guys are all very kind, but you do know that I didn’t INVENT the concept of candy sushi, right? now that sounds like quite the party! no wonder there is so much anticipation each year. Jenny – That is very helpful, and yes, I would like to know how to say one more thing in Japanese: Dinner: A Love Story. Insanely great party idea! Makes me sad that my girl is growing almost too old for parties that are choreographed by her mother. But I’m hoping that candy sushi might still work for a 15 year old and her incredibly cool friends. Thanks! Great looking party!! The ninja game sounds fun! This is freakin amazing!! I LOVE it! I gave the title in kanji and put the hiragana in the parentheses. The way you’d say it would be “yuushoku: ai no monogatari”. Literally, “Evening Meal: A love story”. All the others have said it already but this is truly brilliant! The candy sushi just pushes it over top. Brilliance — bravo! Looks like a lot of fun! I really like the idea of candy sushi. This is so cool! When I was 7, I probably would have asked for a Baby Sitters Club or Heathcliff themed birthday party. Abby is about a million times cooler than I was. I linked to this party from my blog; got me thinking about traditions for my little one. Jenny – this is an AMAZING idea for a birthday! My daughter, who I call a karate princess, would FLIP for this birthday, and me, who is the un-Martha Stewart, could actually pull this off! I like that it is organized, easy and just flows. I might substitute making a teryaki chicken and white rice meal as my kid doesn’t like sushi, but it would still go with the theme and still be simple to marinade ahead of time and bake or stir fry a few minutes before they sit down. P.S. 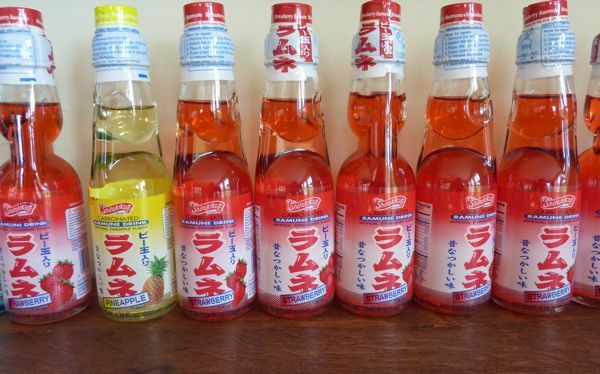 for those looking for the japanese sodas – I’ve found those at World Market before for about a $1. I like the Japan party theme. Made Candy sushi at camp one year and wanted to murder anyone before making stupid candy seaweed again. I think the devil invented fruit roll ups. The kids loved it though, but really what kid doesn’t like sugar. Celebrity is my all time favorite game ever! Almost same conversation goes on in my home, where kids are planning their birthday parties all year long. Though it has become almost a routine for me but I still enjoy doing this kind of stuff with them. Gorgeous party! We are thinking about doing an all around the world birthday party for my daughter’s 8th birthday. 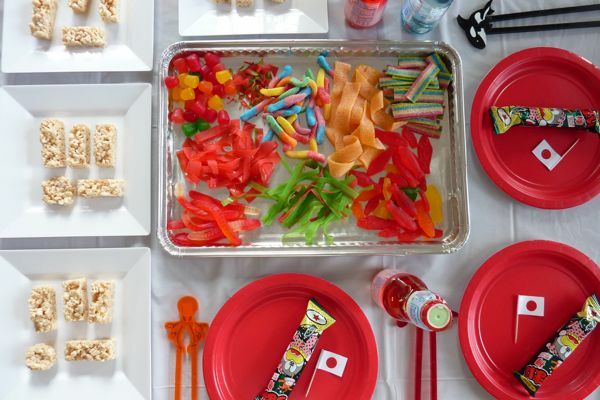 We came across this party, love the idea of the candy sushi! Love the writing in Japan and the translation. Thanks for the wonderful ideas! You killed me 🙂 In a good way! 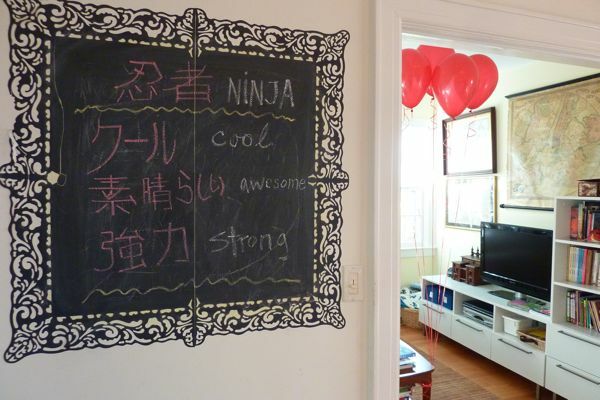 Loved reading this post, as I’m planning a Japanese party for my daughter, and this was so funny – at last someone who doesn’t take things too seriously. Love it! And I’m Japanese. Your Japanese handwriting is awfully good for someone who just looked up the words on Google Translate, by the way. Good job!